In the summer of 1999 a group of university and community women met for lunch to discuss the growing Latino population in Bloomington. Many of which had in one way or another been trying to provide support as interpreter, translator and/or doing referrals to community social service agencies. Within the group there was a varied degree of knowledge and limited ability to maintain any consistent and effective support. As a result the idea came about to create an organization that would address the growing needs within the non-university Latino community. That organization was La Central Latina, Inc. It took a little bit over two years to develop La Central Latina's bylaws, articles of incorporation and begin process of non-profit status. The organization's goal was to facilitate the integration of all local Spanish-speaking and other Latinos into the greater Monroe County community. Two years later through information gathering and discussions with representatives from the City Government, Monroe County Community School Corporation, Latino organizations, religious entities, social service agencies and Latino community focus groups, the number one identified need was the establishment of a Latino community center; El Centro Comunal Latino. The mission of El Centro Comunal Latino would be to provide a safe and accessible space for all Spanish-speaking people and other Latinos to obtain information and access to resources, a venue for community events and programs, a place where those new to the community can secure reliable information about health, safety, and work-related issues, as well as a centralized place to meet and discuss the challenges affecting the community. A board was established for El Centro Comunal Latino in 2003. One of the priority actions set for the organization was to determine the best approach to secure funds. While El Centro Comunal Latino did not have tax exempt status they did file a Business Entity Report with the Secretary of State. In a meeting between La Central Latina, Inc., El Centro Comunal Latino and City Government representatives, it was decided that the best path was to do an informal merger of La Central Latina, Inc. and El Centro Comunal Latino. This was due to similar and overlapping missions and goals of both organizations. In December 2003, in an agreement between the acting board members of El Centro Comunal Latino and La Central Latina, Inc., both organizational boards were merged. From the day of the organizational boards' merger, La Central Latina, Inc. operated under the assumed business name of El Centro Comunal Latino and maintained their tax-exempt ID. The working board no longer files Business Entity Reports for El Centro Comunal with the Secretary of State and no longer adheres to the bylaws of El Centro Comunal Latino. The bylaws for La Central Latina, Inc. were however revised in 2007 by the working board to incorporate many of the ideas and language used in the El Centro Comunal Latino bylaws. In order for all community organizations to provide successful resources we should work together in the same efforts to share ideas that can result to better service our Bloomington community members! 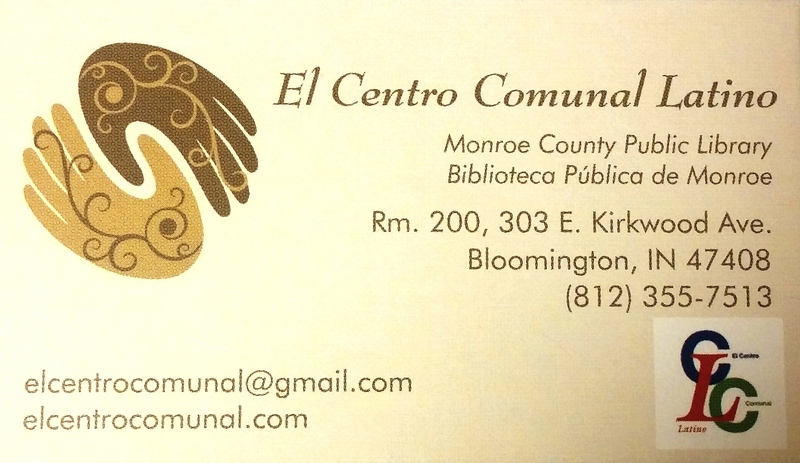 Email El Centro about our events,programs, services, or updates. Leave A Comment and Join Our List Serve TODAY! 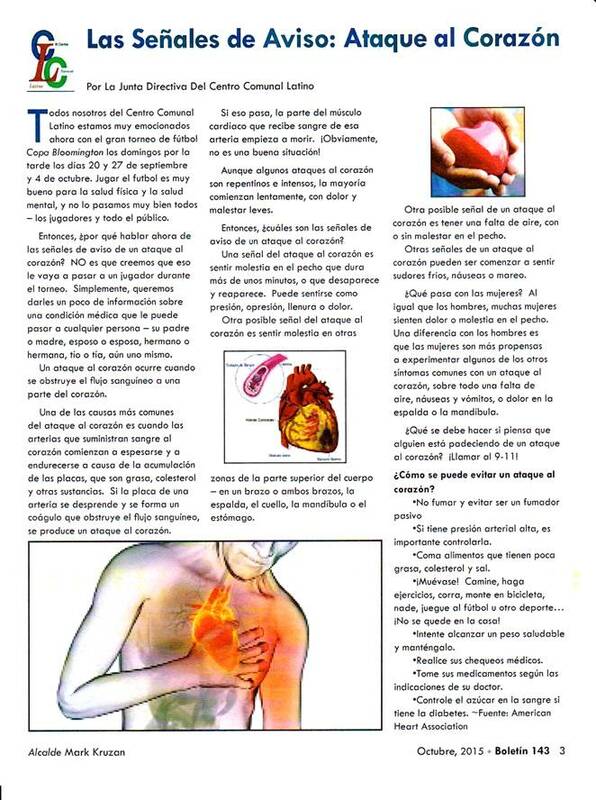 The Boletín Comunitario is a print publication in Spanish from the Community & Family Resource Department in the City of Bloomington where one of our community partner agencies, the Latino Outreach Program, provides us space to publish a monthly entry of our C.C.L. events, services & programs,health issues, etc. Partnerships with local, community based organizations are developed to promote diverse, quality programs and services.